One of my favorite people in the world is Patrick Rhone. He introduced me to other ways to use Backpack through his thoughtful and well-written GTD white paper, has one of my daily-read Tumblrblogs and we’ve developed a wonderful friendship. Two of our common loves are: 1) Anything Apple-related, and 2) Small, smart applications that run intuitively and unobtrusively. To this end, and adding yet another RSS feed to my overworked Google Reader, Patrick has started Minimal Mac – a site ” inspired by a clean, uncluttered, distraction free computing experience” (I paraphrased). Applications already highlighted are productivity apps Notational Velocity and TaskMate. I know from our conversations that Patrick has a backlog of apps to highlight, but he’s also looking for recommendations and submissions, so reach out to him on Twitter (@patrickrhone) or email patrickrhone at gmail dot com. Doin’ it, delegatin’ it, deferrin’ it. I’m starting to look at different ways to update my blogs. As I my professional life gets more intense, I need ways of updating my web presence that easily integrates into my workflow. A new medium that I’m experimenting in is video. Last weekend I bought a FlipCamera Ultra. It’s a really small camcorder that can fit into my bag that I can use to do video blog updates on the fly, short interviews and conference transcriptions. And a built-in USB connector and software makes uploading a snap. I’ve been carrying it everywhere and working on how best to use it. I love working in this new medium and I think it’s going to make my updates easier and more frequent. I’m working on my closeup! The other thing that is making things much easier is Jott. Since I started using it, Jott has made thing much easier. – Update Jott from my desktop. I Jott to myself, I Jott to my friends, I Jott to my collegues, I Jott to my blogs. I’m seeing more and more people in my network Jott-ing. Brian Solis at PR 2.0 just wrote a thoughtful post on how Jott impacts his productivity. Glad to see he’s Jott-ing instead of texting-while-driving! These are two of the services/products I’m using to help me Get Things Done. I’m looking to forward to tracking how these continue to adapt to my workflow. David Allen’s – New Huffington Post Blogger! David Allen, Father of Getting Things Done, now has a reoccurring gig on The Huffington Post! In today’s post, he goes over the why’s and the benefits of GTD. A beginner’s primer. Comments Off on David Allen’s – New Huffington Post Blogger! I’m bitter. I’ve been waiting for this presentation all summer and of course, NOW I can’t go. So someone please go and report back. Merlin Mann! Ethan Schoonover and Ken Case, all talking about OmniFocus. I’ve been using OF since May and love it. And the team is dedicated, supportive and so responsive whenever I report anything. And the updates are constant and really move the product forward. Talk about GTD – Jott is a service that you can call in todos, reminders and more, as well as organizing them online. I’ve been trying to incorporate Jott into my routine for the last couple of weeks (with less success than I’d like – my fault). But I have a feeling that’s all in the past. Jott Links: Now you can update your blog, Twitter™, add to your 30 boxes™ to do list or send a message through Yahoo Groups™ – all with Jott! For example, when Jott asks you “Who do want to Jott” just say “Twitter”, speak your message and your update will appear in text on Twitter. Twitter™, Jaiku™, Zillow™, 30 boxes™, Blogger™, Word Press™, Live Journal™, TypePad™ and Yahoo Groups™ are all accessible with Jott. Jott Folders: With Jott Folders you create preset categories for your Jotts to self. Set up folders for family, expenses, to-do list, or anything that you want. Then simply say the name of the folder the next time you leave a Jott and it’ll be waiting for you in that folder at Jott.com. Jott Reminders: With the new Jott Reminders, Jott can remind you of important events 15 minutes before they start. Just say “Reminder” and Jott will ask you for the date, time, and subject. Now you can stop worrying about remembering those important appointments in your busy life. Profiles: Want to personalize your Jotts? Just create a profile to add your customized signature to the end of every Jott. You can include your name, picture, e-mail, title, and more. Status alerts: Now you can update your mood on your blog, personal home page or other sites. Say “status” when asked “Who do you want to Jott?” and say how you feel that day. Your status will then be posted to the Jott flash widget wherever you put it. There’s also a Jott Lab with new fun widgets and desktop apps. This looks like it just got a whole lot easier to integrate into my system/routine (and a whole lot more fun!). Gus Mueller (of Flying Meat, Inc.) is a Apple software developer for whom I have a lot of respect. My favorite application of his, VoodooPad (I have the Pro version), is an application where you can dump – well, everything. To say that it’s a Wiki developer is one (small) piece of the picture. Go here to see all the other features and view the extremely helpful screencasts. Today on his blog, Gus pointed to a link discussing GTD with VoodooPad. 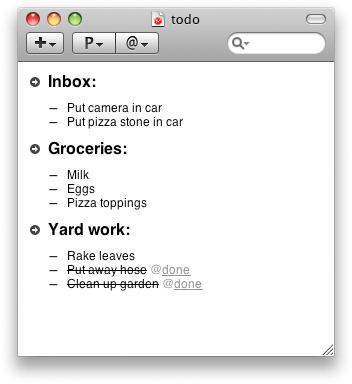 In this post, Chris discusses his GTD system and includes a lua script to use with VoodooPad. I can’t wait to test this out this weekend. Vitalist is an online GTD app that allows you to set-up a online productivity system in minutes (The sign-up page reminds me A LOT of 37Signals). After sign-in, you’re at the Dashboard. On the left is a menu that has the Inbox, Actions, Waiting, Someday, Ticklers, Reference and Search. Another Menu has “My Projects”, “My Contacts” and “My Shares” (Yup, for collaboration!). The main component of the Dashboard is where the Actions, Contexts, Overdue Actions (in red 0- I love this!) and Upcoming Actions. There’s both Free and Paid($5 a month) options, a Forum, Blog and also an iPhone-friendly app. I’ll be watching this in the next few months.